People’s altars are an interesting thing. They vary by spiritual path, by tradition, and by person. No two are ever exactly alike. Some faiths expect a particular setup, some have room for personal expression. Some are minimal, others are packed with all sorts of things. 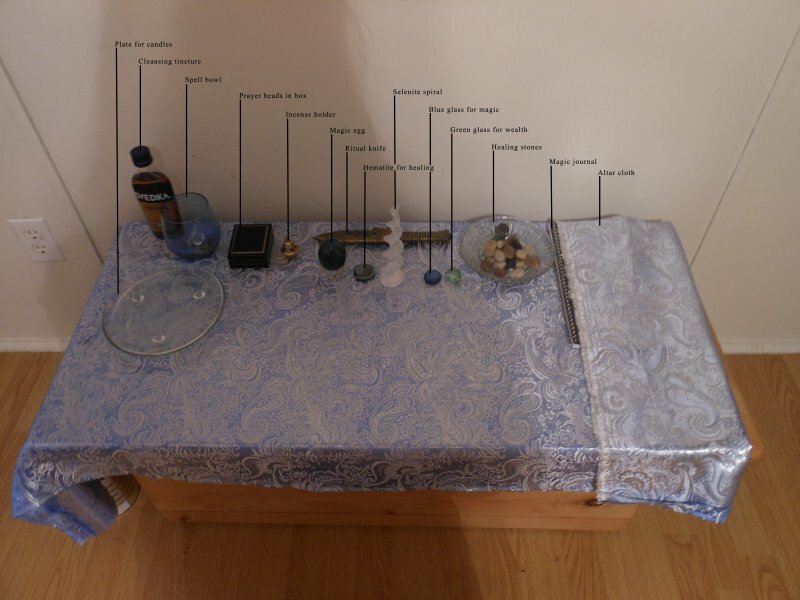 I’m often interested in seeing other people’s altars, even though it’s not something a lot of people share images of. Personally, I’m kind of a minimalist. I’m lucky enough to have an altar that was made especially for me. It has a door on the front and I can keep most of my tools inside when they’re not in use. I don’t like a cluttered space, but some people love to have their area covered with things that they use and love. There have been times when mine had a bit more on it, but typically, I keep it rather sparse, with just the things that speak to me out on top. I’ve shared a couple of photos over the years, I figured it might be time to share another. Plate for candles – I use this to put candles on to reduce risk of them dripping all over the place. I also think it’s pretty. Cleansing tincture – I use this on myself and my tools. I wrote a post on how to make your own. Spell bowl – This is actually an active spell. I like to put various things in a bowl when I do spellwork, then I look at them and focus on them often. Prayer beads in a box – I keep my japa mala in this pretty box for easy access. Incense holder – That one explains itself. Magic egg – This is something that I made, a little complex to explain, but I do have a post dedicated to it. Ritual knife – My lovely ritual knife, usually used for cutting barriers and opening pathways. Hematite for healing – A hematite stone that I use to focus on healing. Selenite spiral – This is to cleanse and charge everything on my altar. Blue glass for magic – A blue glass stone that I use to focus on magical intent. Green glass for wealth – A green glass stone that I use to focus on wealth. Healing stones – Stones that I use for healing. I’ll be writing a post soon on what those are and how to make them. Magic journal – A book with my current magical intentions, spiritual journaling and so on. Not the same as a BOS. I keep it covered with the end of my altar cloth to protect my intentions from negativity. Altar cloth – One of three that I use depending on my mood. Sometimes I have other things on my altar, like candle holders with votives, a pillar candle, or whatever I may be using for a specific ritual or spell. 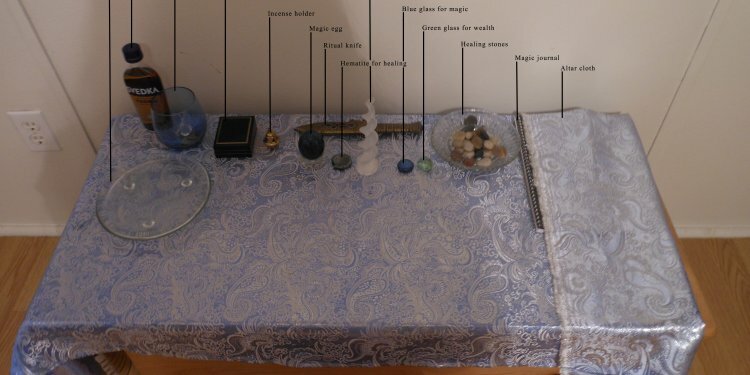 I know my altar is different from what a lot of people use. There are no representations of deity, no pentacles or anything like that. There have been at times, but rarely. Sometimes I have things hung behind my altar on the wall, but right now there’s nothing. The great thing is, no matter what people may tell you, there’s no right or wrong way to set up an altar, no specific way that it “must” be done. You can and should do whatever speaks to you. Make it feel wonderful and inviting and magical. Make it yours, not what anyone else says it should be.